Composer, performer, jazzman, piano and organ genius. 8. Whose Honey Are You? 13. How Can You Face Me? 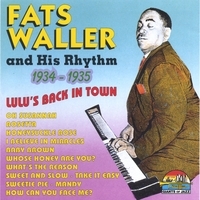 Born in Harlem, New York, Fats Waller recorded his first songs at 18, in 1922. Piano and organ genius, composer and performer, he appeared in Broadway shows and movies; after 1934 he started touring the U.S. (and later Europe) and recording with his combo, Fats Waller and His Rhythm. In 1940 he appeared in the movie Stormy Weather, leading a band inclusing names such as Slam Stewart and Benny Carter. He died in 1943 on a train in Kansas City, while travelling back to New York after a concert in Hollywood.